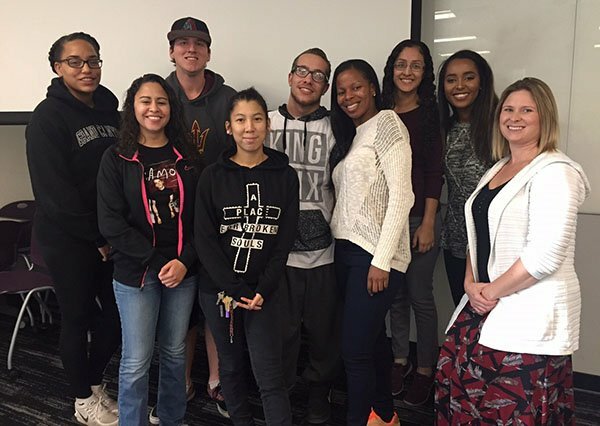 CSET instructor Jamie Cooner (right) with some of the students in her Capstone in Forensic Science course. 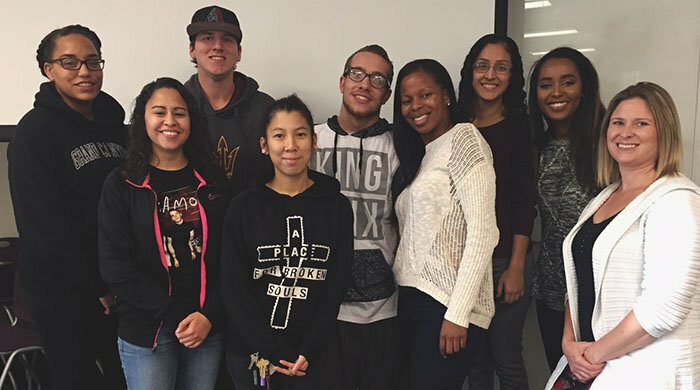 The seniors in Jamie Cooner’s Capstone in Forensic Science course last semester were not your typical group of students who happened to be taking a class together. Don’t believe everything you see on the crime-sleuthing television shows. Despite the glamour with which it is depicted, forensic science is a rigorous, demanding major with science requirements similar to those in GCU’s pre-med program. 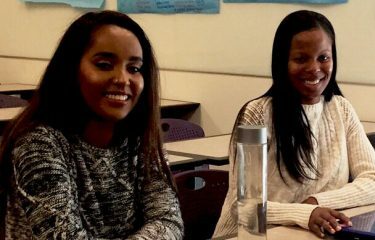 Forensic Science majors Jerusalem Kebede (left) and Cyprianna Smith. To set the record straight on the effectiveness of forensic science, each student contributed to an end-of-semester report on the topic and invited a GCU Today writer to hear their views. “We decided as a whole to write and educate people about the depth of difficulty of forensic science,” said senior Ariel Johnson, a Forensic Science major. In the report, students said that shows such as “CSI: Crime Scene Investigation,” “Dexter” and “Law & Order: Criminal Intent” don’t reflect the grim reality that forensic science is far from ideal. They discovered through research that faulty forensic science investigations can lead to imprisoning the innocent. Just finding DNA at a scene, for example, doesn’t magically lead police to the culprit no matter what the crime is, said senior Joshua Lewis, also a Forensic Science major. DNA processing is time consuming and expensive and can be nullified by equipment failure, human error and inadequate samples, Lewis said. It is not a smoking gun. Each state, crime lab and jurisdiction has the potential to have its own set of procedures — there is no national standard — and evidence is tested on equipment as infallible as the human beings who build and use it. There is much more to processing evidence than meets the eye, said Cooner, a College of Science, Engineering and Technology adjunct faculty member who teaches classes and labs in crime scene processing and physical evidence. “Any trained monkey can go collect evidence and lift fingerprints,” Cooner said. “But the science is not common knowledge. It takes rigorous advanced study. The science classes that GCU requires for the major include chemistry, human anatomy and physiology, crime scene processing, organic chemistry, pathophysiology, principals of biochemistry, genetics, physical evidence, physics, toxicology and body fluid and DNA analysis. The expertise the students gain leads to high paying jobs in such fields as crime labs, hospitals and clinical labs, said senior Jerusalem Kebede. Students also go on to medical school. “The degree plan at this institution is phenomenal,” Kebede said.